The American Heart Association BLS Instructor Course is designed to teach the methods to effectively instruct others in all Basic Life Support (BLS) resuscitation courses to healthcare provider level. The essence of this course is to become proficient in running CPR/BLS/AED Courses. During the course you will practice facilitating a class with lots of role play. The course is building on class facilitation. To successfully complete the course practical skills must be successfully demonstrated and instructor competencies must be achieved. In order to participate in the BLS Instructors Course you must have a current Healthcare Provider Certification and have completed the core instructor interactive course which can be taken at home or online and takes 6-8 hours to complete. Participants should be proficient in the above listed practical skills prior to the course. The AHA only recognises training done through affiliated training sites. Therefore all certified BLS instructors must be affiliated to a training site in order to have any courses they teach recognised. Course completion cards are only issued through the training site co-ordinators. 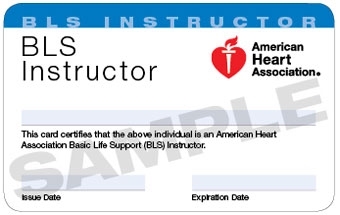 Once the BLS Instructor Course is successfully completed new BLS Instructors must successfully demonstrate their teaching skills while instructing any of the BLS Provider Courses. Monitoring must be done within 90 days of completing the instructor course and monitoring must be completed by a current BLS Faculty member or Instructor Trainer. AHA Instructor Certification valid for 2 years (recognized worldwide). Contact us to schedule your training. Disclaimer: Use of American Heart Association materials in an educational course does not represent course sponsorship by the American Heart Association. Any fees charged for such a course, except for a portion of fees needed for AHA course materials, do not represent income to the Association.